CARBONDALE, Ill. — A free clay target shooting event is being offered to all current military members, courtesy of Veteran Adventures, a program of Southern Illinois University Carbondale’s Touch of Nature Environmental Center. The event will begin at 10 a.m. on July 21 at the Rend Lake Shooting Complex, 17738 Conversation Lane in Whittington. All current military service personnel, from any branch of the armed forces, as well as veterans and members of the National Guard, the reserves and the ROTC, are welcome. Each participant will get to test their marksmanship with 100 clay targets on the complex’s new sporting clays course, which provides a simulated hunting experience. 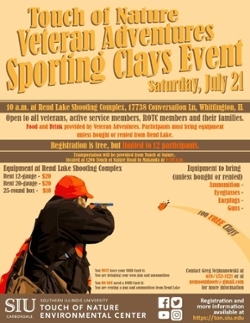 Veteran Adventures will cover the cost of the sporting clays for each participant. Registration is limited to the first 12 people to sign up. All participants should bring earplugs and eyeglasses along with guns and ammunition; they can also rent guns ($20 for a 12-gauge or 20-gauge shotgun rental) and purchase ammunition ($10 for a 25-round box) at Rend Lake. Those who bring their guns and/or ammunition must bring a valid Illinois Firearm Owners Identification (FOID) card with them; those who will rent guns and purchase ammunition on site at Rend Lake are not required to have a FOID card. Veteran Adventures will provide transportation from Touch of Nature, about eight miles south of Carbondale off Giant City Road, to Rend Lake. Departure from the facility, located at 1206 Touch of Nature Road in Makanda, is at 8:30 a.m.
Food and drinks will also be supplied by Veteran Adventures. Space is limited so sign up now online. For more information, visit www.ton.siu.edu or contact Greg Nejmanowski at 618/453-1121 or nemooutdoors@gmail.com. Veteran Adventures covering costs of clay targets, transportation from Touch of Nature Environmental Center, food and drinks. Register online; limited to the first 12 people to sign up. For more information, visit www.ton.siu.edu or contact Greg Nejmanowski at 618/453-1121 or nemooutdoors@gmail.com. Media Contact: Pat Jones, publicity and promotions specialist, at 618/453-3947 or patj@siu.edu.